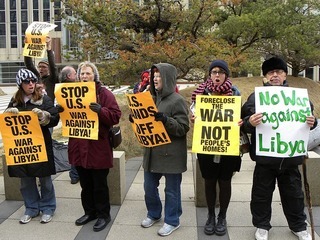 Protest Against U.S. Military Action in Libya - Minneapolis, Minnesota - March 21, 2011 - This was a protest against United States military operations in Libya that started March 19. This was organized by Women Against Military Madness and the Anti-War Committee. Environmental impacts should generally be assessed before a major project is started. Libyan law demands that this must be done. But it did not happen in the case of the GMMR, as Khalifa Elawej, an advisor to the General Board of Environment, points out. The political decision to start was taken in view of an “acute shortage of water”. At the time, the cost of fossil water was only a tenth of that of desalinated water. To date, no environmental impact assessment has been done. According to Elawej, it is impossible to give an accurate account of the environmental effects because relevant data are unavailable. Lots of research would be needed. However, some impacts are obvious, he says. Positive impacts include: The GMMR has helped to expand the green areas in the north and west of the country, stemming further desertification. The green areas contribute to tempering the weather. Traditional water resources in the north have been spared as people can now rely on GMMR water instead. Agricultural production has increased. There are downsides too, according to Elawej. The desert environment of the areas where the fossil water is taken from may be changing. The pipeline network itself may affect the environment. Some of the water is stored in open pools, and evaporation leads to salinization. Salinity of the GMMR water is high according to international standards, though it is not as bad as in the north’s traditional wells, which are affected by an influx of seawater. Since most – and perhaps all – of the fossil water is not renewable, limited resources are being used. In a largely controversial move, in July 2011 NATO planes bombed a water supply pipeline at Brega, as well as a Concrete Cylinder Pipe factory, killing six security guards in the process and jeopardizing the water supply of 70% of the population. The factory was built especially for the project, and was key in sustaining the water supply, being equipped to repair leaks and breaks in the system. 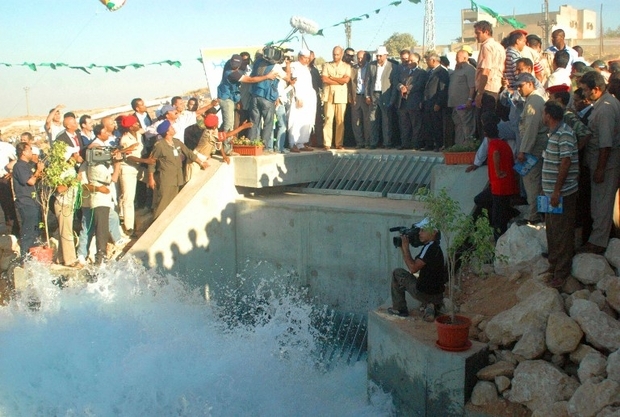 NATO justified the bombing by claiming that it has evidence the factory was being used as a “military storage facility” and that “rockets were launched from there.”  Meanwhile, the GMMR team and managers (loyal to Gaddafi) labeled the bombing of the factory and surrounding infrastructure a crime that threatens the water supply of millions of Libyan citizens. 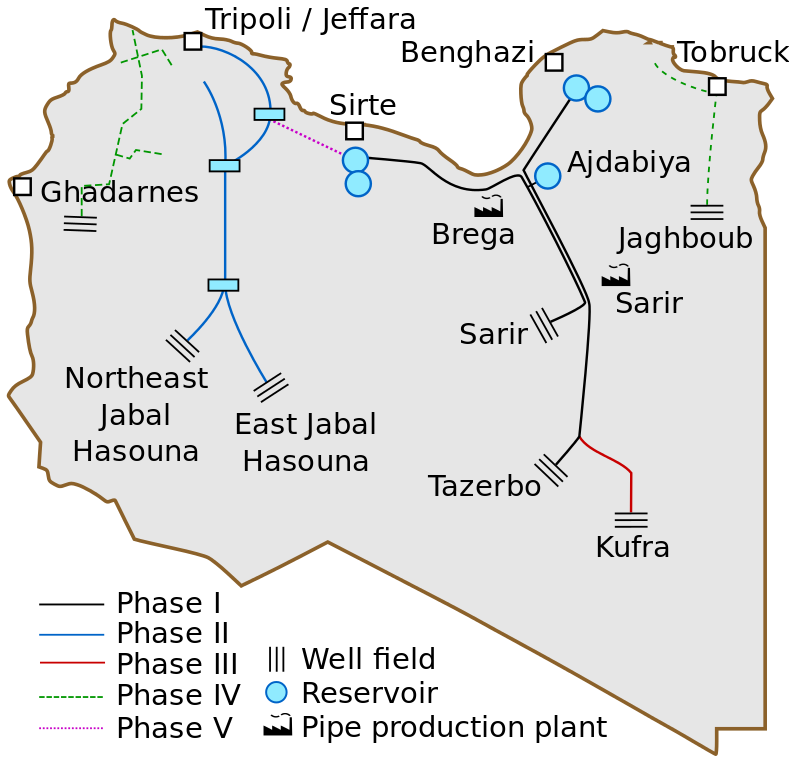 Libyan officials had warned two months before, in May 2011, that NATO airstrikes on the GMMR’s pipelines would cause a humanitarian and environmental disaster. When asked for evidence of military installations in the factory, NATO officials provided satellite images that confirm BM-21 rocket launchers near the facility, which were intact after the bombing. The damage to the facility water not serious enough to completely stop the flow of water in the ‘river’. A few months earlier, NATO also bombed water facilities in Sirte, Gaddafi’s hometown, killing nine state employees who were working during the attack. UN officials reported that if the project is to fail, a massive humanitarian emergency will be caused in Libya. Targeting of essential civilian infrastructure is a war crime under the Geneva convention and, according to Nafeez Ahmed, a deliberate “genocidal strategy” in Libya. A month after the NATO bombing of the GMMR, around half of Libya’s population was without running water. In addition, the bombardment caused a huge number of foreign employees working on the project to flee the country. Later in the same year, UNICEF reported that power cuts and fuel shortages were threatening the functioning of the GMMR by impeding the operation of the water-pumping stations. Such power cuts mean that Libyan citizens, particularly those in Tripoli and Benghazi, have to go without water for 8 or more hours a day. At the time of the UNICEF report, which confirmed that pro-Gaddafi officials were not sabotaging water facilities (as claimed by pro-rebel forces), 4 million Libyans had been left without potable water. It warned that if the situation worsens, it can turn into a serious health epidemic. Agricultural areas dependent on the GMR were also affected. The whole project could collapse if the chaos in Libya continues, causing a water crisis that could affect millions of people. Meanwhile, pro-rebel sources have claimed that pro-Gaddafi officials shut down the supply system as a strategy to win the war. Project Details Libya is located in the arid and semi-arid regions of the world and suffers from intense water shortage and poor water management. It is one of the driest countries in the world, with more than 90% of it desert land. The project started in 1984 and was scheduled to be completed in 25 years. Feasibility studies showed that the GMMR project was more cost-effective compared to three other options of providing Libya with water: importing water by ships, desalination of seawater, or laying a pipeline from Europe. The water comes from the South of the country, from the Nubian Sandstone Aquifer System, the largest fossil water aquifer in the world, covering an area of around two million square kilometers. The giant aquifer spans territories in Southern Libya, Sudan, Egypt, and Chad. The Nubian Sandstone Aquifer includes four freshwater basins within the borders of Libya that contain around 12,000 cubic kilometers of fossil water from the ice age buried as deep as 600 meters underground. 80% of the water provided by the GMMR would be dedicated to agriculture, and the remaining 20% to municipal and industrial use. After completion, irrigation water from the project would enable the cultivation of 160,000 HA of land. The project was designed in five phases, largely separate in their design but making an integrated system in the end. It involved digging around 1,300 wells, some up to 600 meters deep. The project also involved constructing reservoirs and pumping stations. 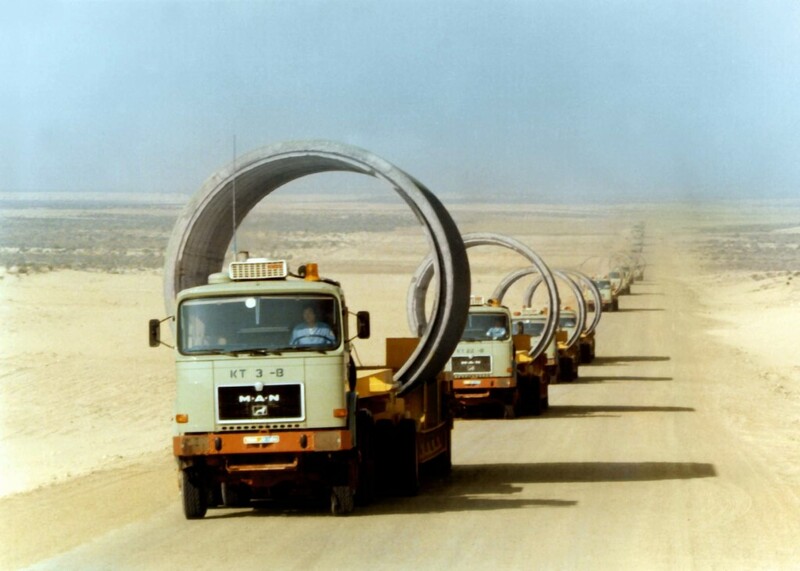 The total length of the concrete pipelines is around 4,000 km with a 4m radius. In 1983, the Great Man-Made River Authority was created by law No. 11/1983 by the general people's congress to implement and manage the GMMR project. 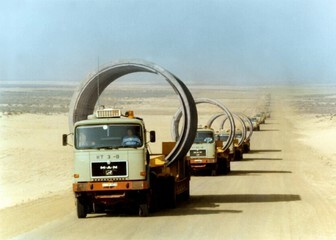 -	The first phase of the project was inaugurated in 1991 and completed in 1996. This system supplies 2,000,000 cubic meters of water per day to Benghazi, the second-largest city in Libya, as well as Sirte, previously Gaddafi's stronghold. -	The second phase finished in September 2000, supplying one million cubic meters of water a day to Tripoli and Jeffara. -	Phases 4 and 5 of the project are on halt due to the conflict in Libya. They involved extending the distribution network and integrating the Eastern and Western networks into a single system. 3. Murzuk basin: south of Jabal Fezzan, 450,000 km squared, estimated to hold 4,800 Km cubes of water. The Great Man-Made Rive Water Utilization Authority is responsible for the use of the water for agricultural purposes. Fees are highly subsidized for farmers (0.62$/cubic meter), and modern drip irrigation techniques are used to minimize water waste. The Secretariat of Municipalities is responsible for the water distribution to cities. More than 30% of the municipal water demand is provided by this project. 2% of the water is used for industrial purposes, mainly for the oil industry. Development of Alternatives From one side, the relevant impact assessment studies should be undertaken to know the potential damages the GMMR has caused since its construction began. On the other hand, the population is demanding regular access to safe drinking water meaning that the government should undertake to provide this service. Why? Explain briefly. Environmental impacts should generally be assessed before a major project is started. Libyan law demands that this must be done. But it did not happen in the case of the GMMR, as Khalifa Elawej, an advisor to the General Board of Environment, points out. The political decision to start was taken in view of an “acute shortage of water”. At the time, the cost of fossil water was only a tenth of that of desalinated water. To date, no environmental impact assessment has been done. In addition, as of today, the new Libyan government has been unable to undertake to required reparations and maintenance works required to keep the GMMR functional and able to provide water regularly to the Libyan people. Transport of Pipes Fleet of more than one hundred transporters has altogether travelled a distance equal to the distance between the Earth and Sun. Protest Against U.S. Military Action in Libya - Minneapolis, Minnesota - March 21, 2011 This was a protest against United States military operations in Libya that started March 19. This was organized by Women Against Military Madness and the Anti-War Committee.